Today In KISStory - 1978: The four KISS solo albums are released simultaneously, shipping one million copies of each album. KISS was at their commercial peak by 1978. Alive II was the band's fourth platinum album in just under two years, and the ensuing tour had the highest average attendance (13,550) in the group's history. In addition, Kiss' gross income for 1977 was $10.2 million. The group, along with creative manager Bill Aucoin, sought to take the band to the next level of popularity. To that end, an ambitious, two-pronged strategy was devised for 1978. The first part involved the simultaneous release of four solo albums from the members of Kiss. Although Kiss has claimed that the solo albums were intended to ease rising tensions within the band, their 1976 record contract did in fact call for four solo records, with each of them counting as half an album toward the group's five-record commitment. 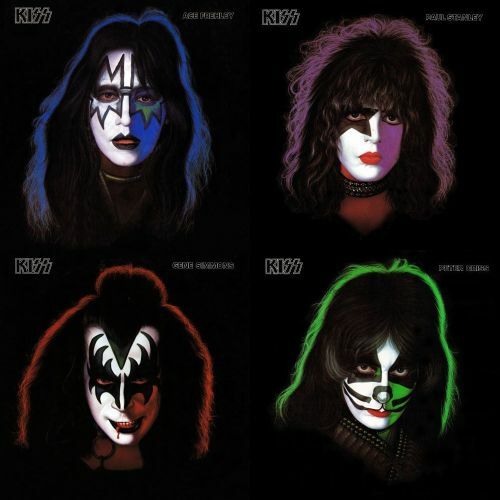 While each album was very much a solo effort (none of the group appeared on another's album), they were all released and marketed as Kiss albums (with similar cover art and poster inserts). It was the first time that all current members of a rock band had released solo albums on the same day. For the band members, it was a chance to showcase their individual musical styles and tastes outside of Kiss, and in some cases to collaborate with contemporary artists. Stanley's and Frehley's albums stuck pretty closely to the successful hard rock style that Kiss had utilized, while Criss' album featured an R&B style and was loaded with ballads. Simmons's was the most eclectic of the four. It featured hard rock, ballads, Beatles-influenced pop, and ended with a straight cover of "When You Wish upon a Star" (from the film Pinocchio). Simmons' many collaborators included Aerosmith's Joe Perry, Cheap Trick's Rick Nielsen, the Doobie Brothers' Jeff "Skunk" Baxter, disco diva Donna Summer, Janis Ian, Helen Reddy, Bob Seger, and then-girlfriend Cher. The Kiss solo albums were released on September 18, 1978. The marketing blitz behind the albums was unprecedented. Casablanca announced it was shipping five million total copies of the albums (guaranteeing instant platinum status), and they spent $2.5 million marketing them.All four solo albums made it into the Top 50 of the Billboard album chart. However, the massive preorder for these albums was soon followed by an equally enormous attempt to ship them back to the record company, followed by the subsequent discounting of these albums once sales had (very quickly) peaked. The albums were also the first Kiss albums to be seen in the "bargain bins. "All four solo albums sold about as many copies as Love Gun alone. Of the four, Frehley's album was the most successful (although not by a huge margin) and spawned the only radio top 20 hit (Russ Ballard's composition "New York Groove", originally performed by Hello).